Just sitting here wondering about an acoustic ukulele made from plexiglass. Not like a giant chunk of plastic that has been drilled out to take the electrical components of an electric ukulele. But instead sheets of plexiglass that are cut and molded just like a conventional wood acoustic ukulele. Obviously it wouldn't have that warm look of wood. Wonder what a well made one would sound like? Before ukulele, our family's business was custom acrylic fabrication. My father made one, while we still did plastic and ukulele. The only non plastic parts were the metal for the tuners and fret wire. It looked amazing, but sounded absolutely horrible. wouldn't that just be a tv pal or other the myriads of plastic ukes from the 50's? Acrylics are great for electrics but are lousy for acoustic instruments because they're so dense. Dan Armstrong and Ampeg mass-produced a Plexiglas electric guitar and bass which are available as re-issues. I've played vintage versions of both, and neither is something you can use in any sort of acoustic way because they just don't make much sound on their own. Fender also built a one-off Lucite Stratocaster as a marketing gimmick. 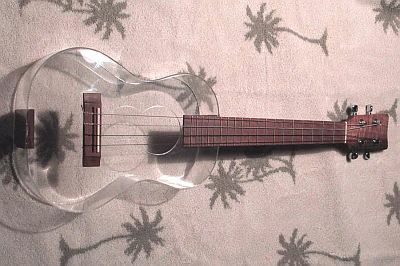 I think an all-plastic uke (like a better version of the TV Pal) could be done with attention paid to materials and build. And I'd probably buy one if it was priced like fleas and flukes. I'd love an instrument you could really take to the beach. Last edited by Blrfl; 10-06-2009 at 12:51 AM. I had been wondering/hypothesizing about the tone thing. Especially in light of an article I read in the last week or two about how some lab was able to get tonewoods sounding like stradivarius after subjecting the wood to soaking in water with some type of fungus. I was wondering about thinning the top tremendously. From what I read most of the sound comes from the top. Of course then it would be an exercise in polishing the plexiglass back to it's original optical properties. Maybe a red body with clear plexiglass top that has been thinned tremendously with fanned supports made from blue plexiglass. The neck and head being made from various colors of plexiglass laminated together. Makana DeLovio no longer makes those. Be not afeard: this link is full of noises, sounds, and sweet airs, that give delight, and hurt not.